The last solution for a severely broken tooth that is non restorable is to have it removed. An oral surgeon is needed for some difficult extractions such as fully impacted teeth or an infected tooth with an abscess. Bone grafts are natural bone materials that are placed inside the bone immediately after extraction. Bone grafting will reduce the risk of post operative complications like pain, infection, bleeding, and swelling and will also prevent shrinkage of bone after typical a extraction. Severe tooth decay or infection. Despite the reduction in world-wide prevalence of dental caries, still it is the most common reason for extraction of (non-third molar) teeth with up to two thirds of extractions. Insufficient space for wisdom teeth (impacted third molars). Simple extractions are performed on teeth that are visible in the mouth, usually under local anaesthetic, and require only the use of instruments to elevate and/or grasp the visible portion of the tooth. Typically the tooth is lifted using an elevator, and using dental forceps, rocked back and forth until the Periodontal ligament has been sufficiently broken and the supporting alveolar bone has been adequately widened to make the tooth loose enough to remove. 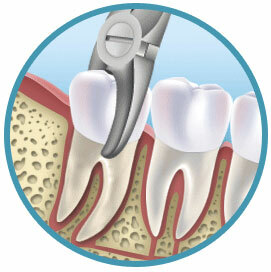 Typically, when teeth are removed with forceps, slow, steady pressure is applied with controlled force. Surgical extractions involve the removal of teeth that cannot be easily accessed, either because they have broken under the gum line or because they have not erupted fully. Surgical extractions almost always require an incision. In a surgical extraction the doctor may elevate the soft tissues covering the tooth and bone and may also remove some of the overlying and/or surrounding bone tissue with a drill or osteotome. Frequently, the tooth may be split into multiple pieces to facilitate its removal. The most common use of bone grafting is in the application of dental implants, in order to restore the edentulous area of a missing tooth. Dental implants require bones underneath them for support and to have the implant integrate properly into the mouth. People who have been without teeth for a prolonged period may not have enough bone left in the necessary locations. In this case, bone can be taken from the chin or from the pilot holes for the implants or even from the iliac crest of the pelvis and inserted into the mouth underneath the new implant.